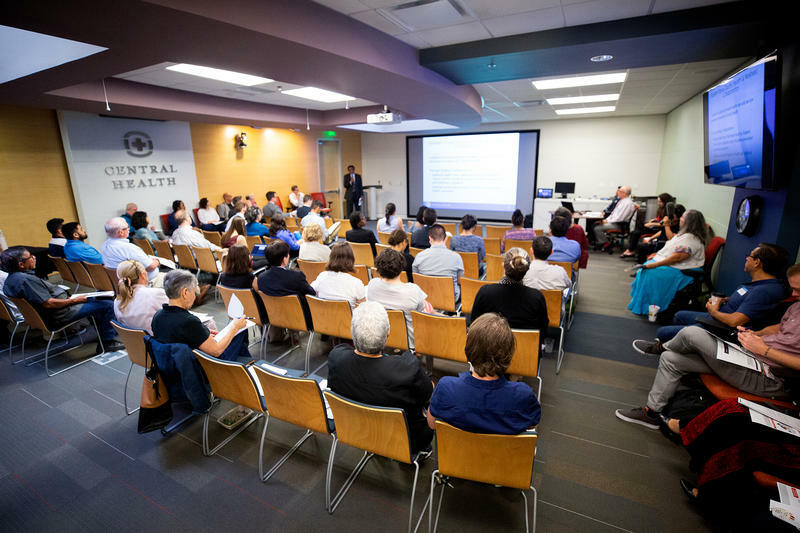 Researchers surveyed 1,367 Texans between March and May of this year about topics ranging from Medicaid, the Affordable Care Act, maternal mortality and the role of government in tackling health care issues. 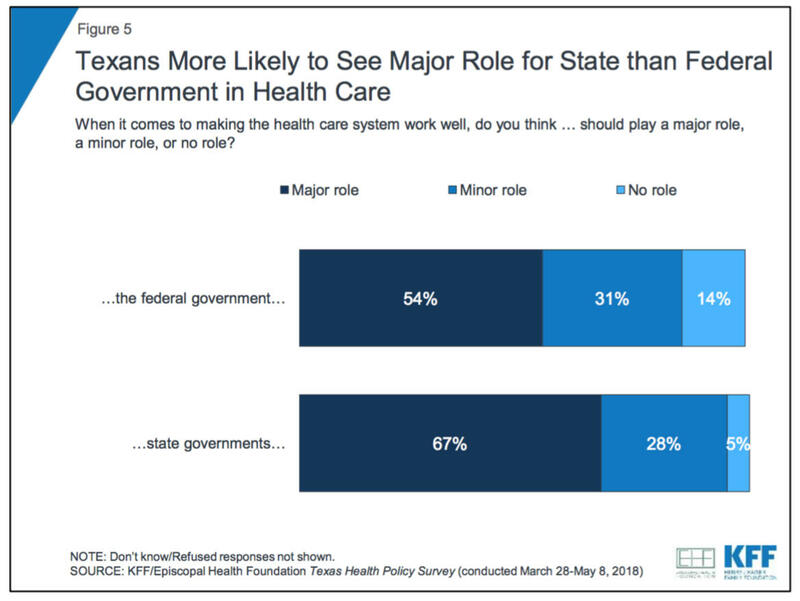 Texans overwhelmingly agree that the state should have a role in making health systems work. 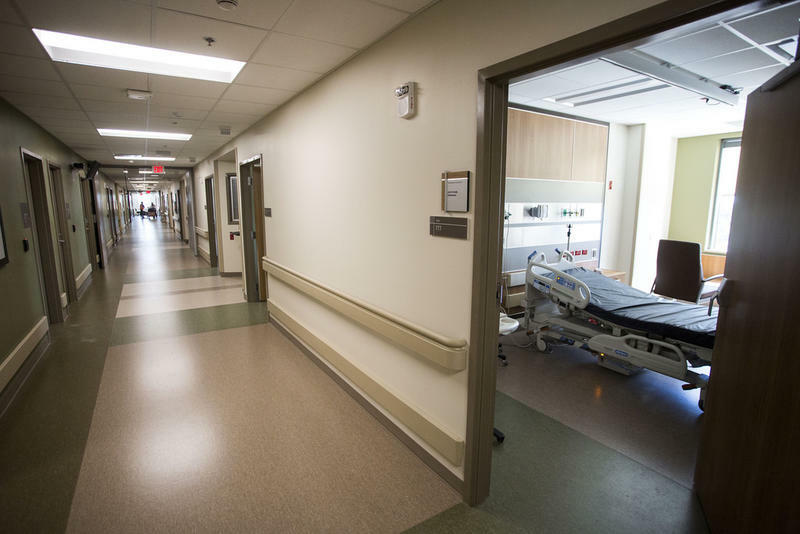 According to the survey, 67 percent of those surveyed said the state should have a “major role” and 28 percent said a “minor role” in health care. Only 5 percent of Texans said the state should have no role. That response came in a close second to “lowering the amount individuals pay for health care” (61 percent). Marks says she thinks a lot of this concern is probably related to media coverage around maternal mortality and that the question itself is really a "no-brainer." 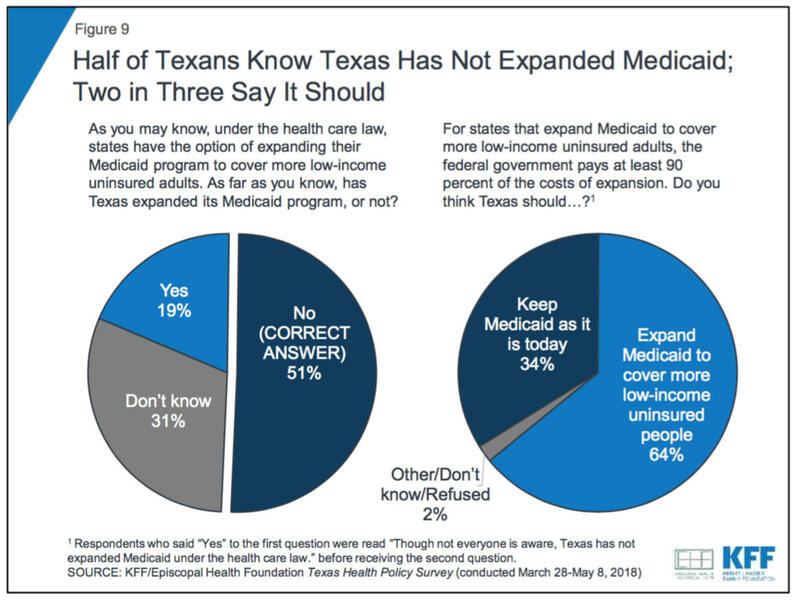 About two-thirds of Texans (64 percent) said they think Texas should expand Medicaid to cover more low-income people. 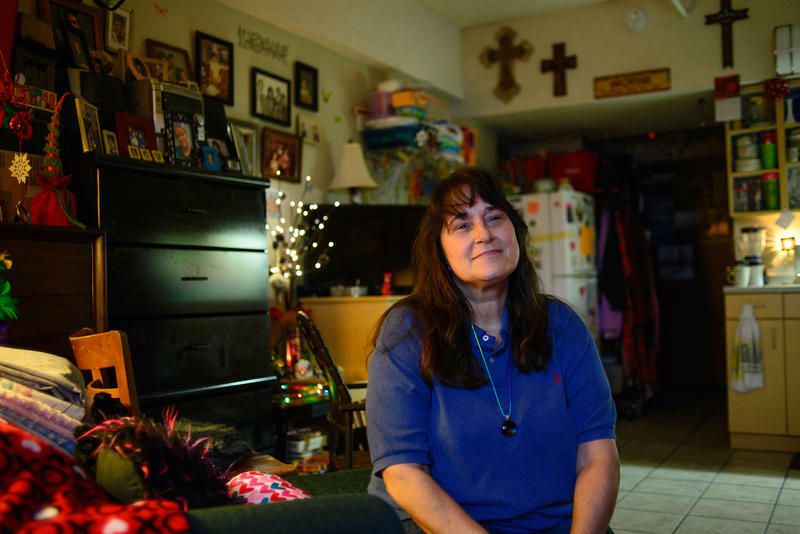 Texas is 1 of only 17 states that have not expanded Medicaid under the Affordable Care Act. Even though feelings in the state are still mixed on the ACA, the survey found that Medicaid is quite popular. "Roughly 4 million people are covered by Medicaid in Texas, nearly three-quarters of whom are children," according to the survey's authors. When asked, 6 in 10 Texans said Medicaid is important to their families. Marks says she thinks the conversation about Medicaid expansion in Texas is limiting for people seeking more insurance coverage here. She says the state should have a conversation about coming up with its own way to expand access to affordable coverage, which is a popular idea across the political spectrum. “Let’s stop talking about Medicaid expansion and let’s start talking about expanding access to affordable health insurance coverage,” Marks says. 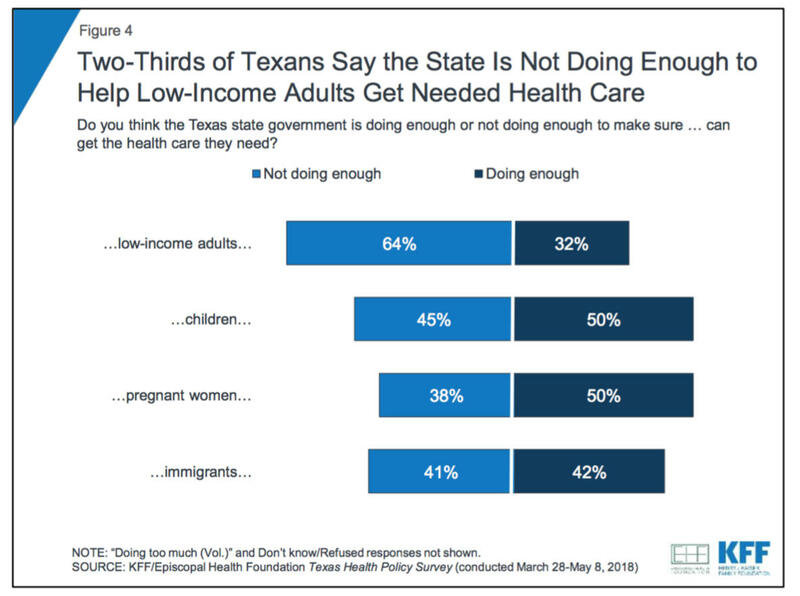 Roughly two-thirds of Texans also say the state is not doing enough to make sure low-income people get the health care they need. Respondents also think lawmakers could do more to help children (45 percent) and immigrants (41 percent) get coverage. Broken down by party, Republicans were less likely to say that the state is not doing enough to help vulnerable populations get health care services. One of the standouts in this survey is how little people know about the state's health care system. Consistently, however, Republican respondents were more likely to be misinformed. For example, groups asked Texans whether the state’s uninsured rate is higher compared to other states. According to the survey, 3 in 10 Texans (31 percent) correctly answer that it is higher. Broken down by party, only 24 percent of Republicans knew Texas has a larger than average share of uninsured people, while 38 percent of Democrats did. Marks says that could explain why Republicans are less likely to say they think there are problems with the state’s health care system. “If you think we have about the same or lower uninsured rates, then you don’t think there’s a problem unique to us that we need to solve,” she says. Texans were also asked whether Medicaid had been expanded in the state; 51 percent of those surveyed correctly said the state had not expanded it. According to the study's authors, “Democrats are somewhat more likely than Republicans and independents to know that Texas has not expanded its Medicaid program" (62 percent, 43 percent, and 52 percent, respectively).